We had a big event just a few days ago. Right next to the boat Kyle tipped his bike over into the water. He lay down on the dock and cried for a minute or two. 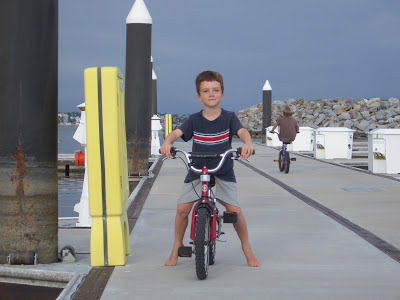 He said it was the worst day of his life and listed off all the things he wouldn't be able to do on his bike anymore, no more riding his bike up to the truck each morning before school, no more riding around with his friends, and no more riding his bike with us on chores. A huge tragedy! I tried to swim down to rescue it (it sank very quickly) but didn't have the lungs for it (probably 10 ft down in murky water). Ken came home shortly after the disaster. He put on some fins and a diving mask, dove down and managed to rescue the bike. Ken was a hero! Kyle wanted to pay him all the money he had in his little bank. We suggested a simple "Thanks." Let's hope the bike lasts while we are here in La Cruz despite the saltwater treatment.